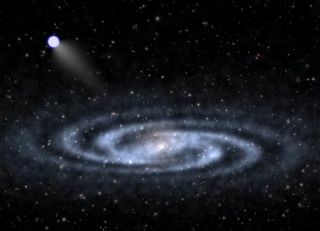 An astrophysicist-artist's conception of a hypervelocity star speeding away from the visible part of a spiral galaxy like our Milky Way and into the invisible halo of mysterious "dark matter" that surrounds the galaxy's visible portions. University of Utah researcher Zheng Zheng and colleagues in the U.S. and China discovered the closest bright hypervelocity star yet found. The discovery of a super-fast star streaking away from the Milky Way may give astronomers a new glimpse at some of our home galaxy's most mysterious details, from its enormous central black hole to the invisible "halo" of dark matter at its far outer reaches. The so-called "hypervelocity" star is traveling at 1.4 million mph (2.3 million km/h) relative to our solar system, about three times faster than a typical star, a new study reports. The star lies 42,400 light-years from Earth, above the disk of the Milky Way, and is cruising toward the halo of dark matter that surrounds the galaxy. Dark matter is so named because it apparently neither emits nor absorbs light, making it impossible to detect directly with telescopes. But astronomers know the mysterious stuff exists because its gravity pulls on the "normal" matter we can see and touch. In fact, scientists think dark matter makes up about 80 percent of all matter in the universe. Some of it is concentrated in haloes surrounding galaxies like our own Milky Way. These haloes can be probed by faraway hypervelocity stars like the newfound LAMOST-HVS1, which Zheng and his colleagues discovered using the Large Sky Area Multi-Object Fiber Spectroscopic Telescope in China (hence the name). LAMOST-HVS1 is the closest and second-brightest of the 20 or so hypervelocity stars that have been discovered so far. But it's not a great skywatching target; with a magnitude of 13, it's about 630 times dimmer than the faintest naked-eye stars, researchers said. At nine times more massive than the sun, LAMOST-HVS1 is also among the largest of all hypervelocity stars. The star is just 32 million years old, compared to 4.6 billion years for our own sun. Astronomers think hypervelocity stars are the remnants of binary star systems that got too close to the supermassive black hole that lurks at the Milky Way's center. The black hole's gravity captured the other member of the pair, the idea goes, and sent the hypervelocity star rocketing out toward the galaxy's edge. "If you’re looking at a herd of cows, and one starts going 60 mph, that's telling you something important," Ben Bromley of the University of Utah, who was not involved with the new study, said in a statement. "You may not know at first what that is. But for hypervelocity stars, one of their mysteries is where they come from — and the massive black hole in our galaxy is implicated." The Milky Way's disk is about 100,000 light-years wide, but the galaxy's diameter is actually about 1 million light-years when the dark matter halo is included, Zheng said. LAMOST-HVS1 is about 62,000 light-years from the galactic center, both beyond and above the visible disk. The new study was published recently in Astrophysical Journal Letters.